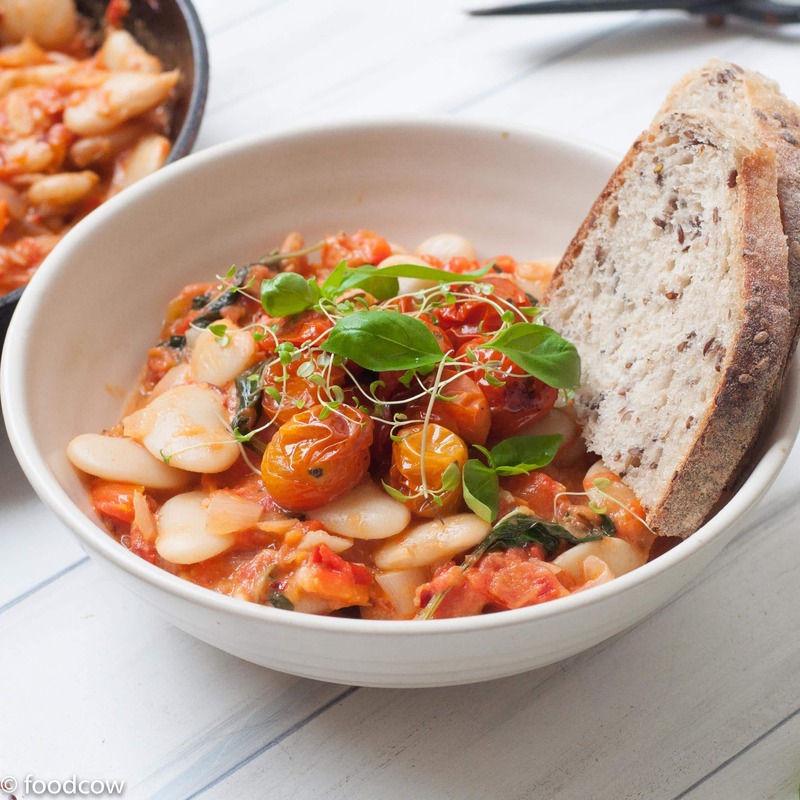 I am always looking for meals that can serve a large crowd and be made in advance.This Italian White Butter Beans and Tomato Stew is just that.You can not only make this ahead of time but also freeze it for later use. It’s the perfect Vegan (Hence Vegetarian) option – it has good amount of protein from the beans and the flavour from the tomatoes, bell pepper and herbs.It’s a recipe made for success really! Let’s talk about Butter Beans,shall we?Lima Beans are large white colour kidney shaped beans.They are a great vegan source of fat free protein and have a high glycemic index- which means they are great for people with diabetes. What are they and how do we cook Lima Beans? Though I call it “italian”, butter beans are by no means limited to Italy.Infact it is very popular in India.They go by many names – Lima Beans in the USA,Butter Beans in Europe,Double Beans in India.My househelp,here in Bangalore tells me that they use these beans to make a spicy Pulav. The butter beans need to be soaked overnight and then boiled, like their cousin Rajma.Here in India we pressure cook it, which takes lesser time than boiling it in an open vessel.Though, If you are short one time, use canned Lima Beans – already cooked Lima beans will reduce your effort and time and make this dish possible in less than 30 minutes. I spotted these beans at my local grocer here in Bangalore a couple of months ago.Since then I have been looking for recipes which celebrate this bean.If you follow me on Instagram you would remember my try at making Ankiet Gulabani’s Vaal Nu Shaak Parsi version of butter beans. This stew has multiple layers of flavour from the fresh tomatoes,the roasted cherry tomatoes, the blackened red bell pepper and the herbs. Roasting the Cherry Tomatoes and the red bell pepper helps release the natural sweetness in both the ingredients.It also gives this stew a bit of a depth and helps balance the acidity from the fresh tomatoes. The white butter beans not only add the much needed protein to this dish but also add a great buttery contrast to the otherwise spicy tomato sauce. In India, fresh tomatoes are available aplenty and that’s why we hardly ever buy the canned stuff. To make this stew, I have crushed the tomatoes roughly using a food processor.All you need to do is cut the tomatoes in wedges and pulse it in the processor 4-5 times and the result will be a rough but not pureed crushed tomatoes which give a nice texture to the stew. For a Vegan version of Italian White Butter Beans and Tomato Stew- Skip the Cream or substitute it with cashew cream or coconut cream instead. Soak the butter beans overnight in a large vessel with triple the amount of water. Next day,Pressure cook the beans with triple the amount of water for 20 minutes/ Alternatively boil in water till almost done- soft but not breaking or loosing shape. Meanwhile In a pan, heat the olive oil. Add the chopped garlic and onion. Cut the tomatoes into large wedges and pulse 3-4 times in the food processor so they get crushed but not into a puree.Chunks of tomatoes should be visible. Once the onions are translucent, add the crushed tomatoes and cook for 10-15 minutes till they are soft. Remove the skin of the red bell pepper and chop it up.Add it to the onion tomato sauce. Sprinkle the salt,herbs and chilli flakes. When you see the tomatoes have softened add a tbsp of cream.Mix well. Drain the water from the lima/Butter beans and add to the stew.Cook for another 5 minutes. Garnish with fresh herbs, roasted cherry tomatoes and serve. This can be eaten with Rice,Quinoa or bread. Tomatoes need to be roughly crushed and used along with their juices-I find that pulsing them in the food processor gives a better result then actually crushing them. Some MUST try dishes from the blog.